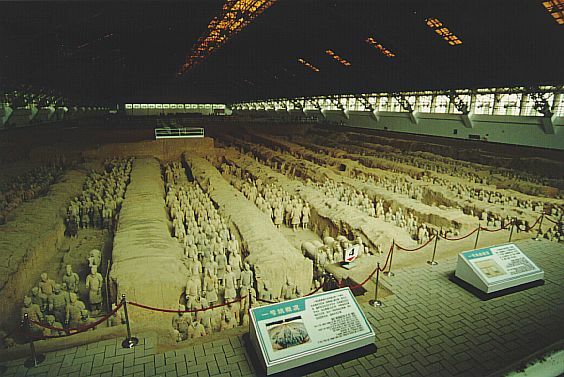 In IIIème century before our era, near from Xi'an, the Chinese emperor is made build a sumptuous tomb. The treasure of the imperial tomb remained untraceable, because the entry was never found. 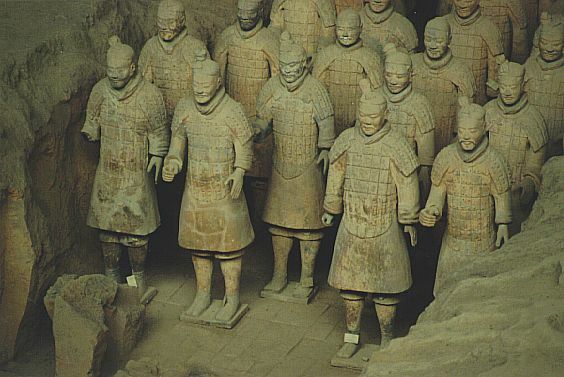 In any case, some say that it would not be there : the emperor would have built this tomb to protect another secret tomb where it would be really buried. Thus, the true treasure of the emperor rather consists of statues. Because to 1,5 km of the tomb, in 1974, of the peasants discover by digging a well a gigantic gallery. Strange and alarming contents : hundreds of statues of soldiers and horses, natural size. It is the first pit of what one will call the cooked Army, and one will discover two other pits : one in 1980, one in 1994. The principal pit measures 210 m of is in west and 60 m of north in the south, with 7 m height. In the principal pit, 7000 statues are turned towards the east, on 11 lines : infantrymen, drivers of tanks, riders... All equipped with their own expression of the face, and especially all equipped with true weapons (mow weapons were removed today, but were remarkably well preserved). They measure all between 180 and 186 cm. These statues inform us about the techniques of combat of the time : 10,000 weapons were found. But their role is currently unknown were they used to frighten enemies who would observe them by far, or were to accompany the emperor in beyond ?